Given their size, complexity, and array of divergent goals and audiences, it has been said that designing an effective website for a college or university is among the most daunting web design challenges. In such an environment, being territorial, irrationally protective, or just too thin-skinned to face the feedback fire will not yield the truth needed to avoid mistakes or take full advantage of proven tactics. Tapping the expertise of colleagues who have traveled the same thorny paths, who know where both the pitfalls and windfalls lie, is too vital. 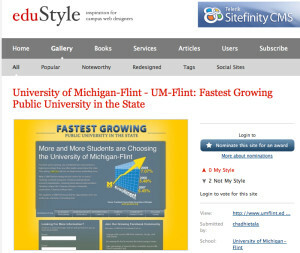 In that spirit, UM-Flint’s Office of University Relations requested an eduStyle review of the website we developed as part of our current “Fastest Growing” campaign. We encourage all higher education marketing and communication professionals to weigh in on how effectively you think umflint.edu/growing communicates and explains the relevance of the fact that “UM-Flint is the fastest growing public university in the state of Michigan.” Thanks!